A study found youth and high school football players hit frequently in the head showed signs of damage to brain development after one season. The study observed players who were split into high-impact and low-impact groups. The researchers are hoping to look into the long-term effects on the players in the future. A study found youth and high school football players who were hit in the head frequently showed signs of damage to brain development after only one season of playing the sport. The study, presented at Radiological Society of North America’s (RSNA) annual meeting, observed 60 youth and high school football players over a single football season who did not have prior concussions or histories of developmental, neurological or psychiatric problems, according to RSNA’s press release. Twenty-four players were determined to be high-impact players while 36 were placed in a low-impact group based on “each player’s risk of cumulative head impact exposure” according to the Head Impact Telemetry System (HITS), which helps collect data through sensors on the players’ helmets. Those who experienced a high number of head impacts showed changes in pruning, or the decrease in gray matter volume, according to the press statement. Gray matter controls actions like motor and sensory movements and speech. Pruning gets rid of unused neural connections in the brain, which is vital for healthy brain development. Most impacts to the head occurred during practice, the news release said. 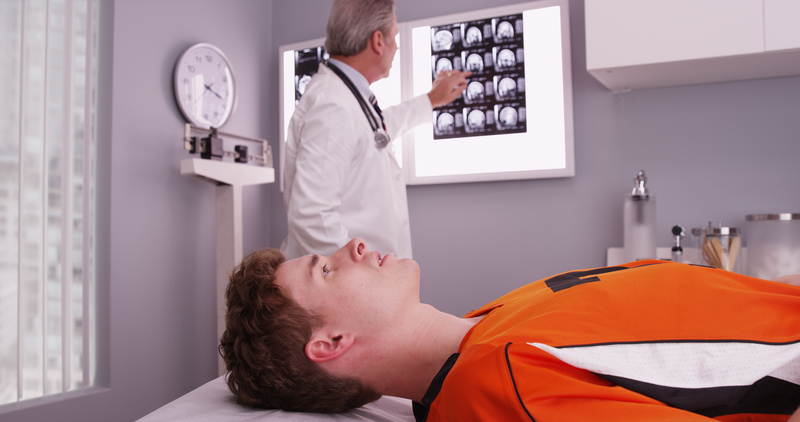 Pictured is a football player lyding down while a doctor reviews his x-rays. SHUTTERSTOCK/ Rocketclips, Inc.
Murugesan and Davenport were two of 11 co-authors. The researchers of the study are not necessarily giving “clinical recommendations” for whether students should or should not play football. Chris Nowinski, Ph.D and Concussion Legacy Foundation’s co-founder and CEO, however, said parents should not allow their children to play tackle football before high school. “The risks to brain development are simply not worth the perceived benefits,” Nowinski told TheDCNF over email. Previous research by the American Medical Association found 177 former football players, ranging from high school to NFL players, showed some degree of chronic traumatic encephalopathy (CTE). CTE is a degenerative brain disease that has been linked to frequent head trauma. Another study looking at the long-term risks of playing football found more than 40 percent of former NFL players showed signs of traumatic brain injury, according to Scientific American. Children who played tackle football before the age of 12 and continued to play in high school would have trouble managing behavior later in life, Time reported.